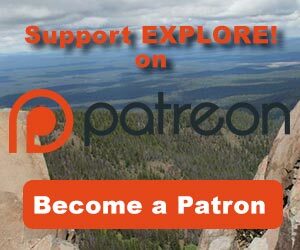 Gillem’s Camp - Explore! Gillem’s Camp - Explore! The Modoc War . . .
Gillem's Camp in 1873. Photo by Louis Heller. Gillem’s Camp is an important site associated with the Modoc War of 1872 and 1873, although it was only in use for about seven weeks. Very briefly, the war came about after members of the Modoc Tribe decided to leave the Klamath reservation, where they were confined. They had been forced away from their homelands to the reservation that had been formed from the homelands of the Klamath Tribe. This did not sit well with some of the Modocs. They did not have access to their own sources of food, so were dependent upon the U.S. Army to supply them. When the army failed to provide the expected food, due to a lack of funds, a band of Modocs, led by Captain Jack, left the reservation in the spring of 1870 to return to their homeland south of the reservation, on the lower Lost River near Tule Lake, where they could feed themselves. They lived there more or less peacefully with the new settlers for a couple of years. However, the settlers remained concerned about the Modocs in their midst and encouraged the government to remove them back to the reservation. After failing to persuade the Modocs back to the reservation, the army was finally, in 1872, ordered to move them back to the reservation, by force, if necessary. In November of 1872, Captain Jackson and a troop of 35 soldiers along with a group of civilians attacked the Modocs at the Lost River. Captain Jack retreated to the Lava Beds across Tule Lake by canoe, but another Modoc, Hooka Jim, circled the east side of Tule Lake killing 18 men and boys that were working in the fields along his way to the lava beds. On January 17, 1873, Lieutenant Colonel Wheaton brought the fight to the lava beds with 300 troops and howitzers and was soundly defeated by the 60 Modoc warriors. After peace negotiations failed, General Canby and Colonel Gillem begin applying a tactic of moving the troops gradually closer to the lava beds in an effort to intimidate the Modocs. 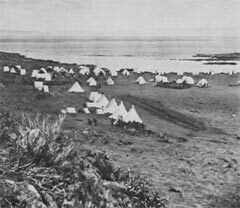 The tactic didn’t work, but on April 1, 1873, it led to the establishment of an army camp on the shore of Tule Lake just north of the lava beds. 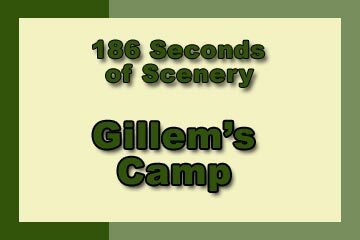 The camp became known as Gillem’s Camp and is the location of our explorations. 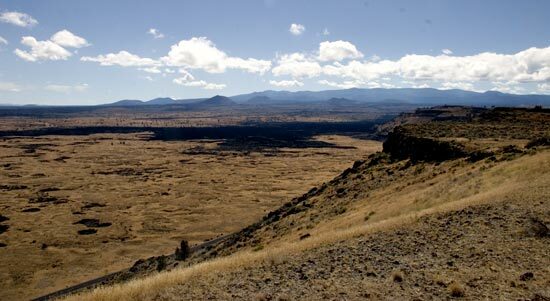 Today, Gillem’s Camp is within Lava Beds National Monument. The Park Service has constructed a short interpretive trail and provides a brochure, keyed to points along the trail. Pick up the brochure at the trail head for $0.25. I explored the trail and the remnants of the camp and hiked to the top of Gillems Bluff along the original trail that was used to bring supplies to the troops. The obvious remains of the camp are three rock walls. One large rectangular wall surrounded the camp’s cemetery. Reports indicate that this was intended to be a temporary resting place and that most of the army’s 30 dead were relocated to the cemetery at Fort Klamath after the war. A smaller, circular wall is listed on Park Service materials as a redoubt. Some suggest that the army’s howitzer was placed there and the design of the wall and the floor of the enclosed circle would suggest that. However, howitzers were never brought to the camp. One report holds that at least one captured Modoc was held there as a prisoner, so it may have been a sort of stockade or corral. These two features can be seen in both the 1873 photo above and the recent photo, right. Another small rock wall, located near the restroom, was apparently used as a guard post. Reports suggest there were at least 15 such guard posts around the camp. Further exploration might find their remains. The first thing that is noticeable in the photos is the missing lake in the recent photo. 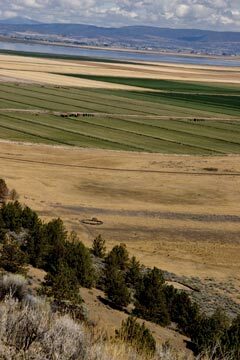 In the early 1900’s, Tule Lake was re-engineered to create valuable farmland. Today, the lake is much smaller and excess water that arrives there via the Lost River is pumped from the Tule Lake National Wildlife Refuge through the hillside to the Lower Klamath National Wildlife Refuge. The lake shore in 1873 would have been about half way between the circular corral and the green field. I noted the various remnant items the Park Service highlights including a concrete foundation from a Civilian Conservation Corps camp that operated here from 1935 to 1942. I spotted additional evidence of the CCC camp in the form of concrete pieces and broken glass. I also saw occasional small pieces of obsidian (a black volcanic glass). Obsidian wasn’t deposited here naturally, so it must have been carried here by people – probably the Modocs who used it for weapons and tools. Signal Rock, the red rock just above the trees to the left of center, and Schonchin's Rock to the right. Signal Rock, red arrow, as seen from Hospital Rock. On the hillside above the Camp, Gillem’s Bluff, I checked out two rock formations. The first is a spire known as Schonchin’s Rock. 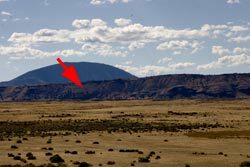 The second is a red colored outcrop known as Signal Rock. From this rock the army’s signal men, using flags, were able to communicate with their counterparts on Hospital Rock, almost 4.5 miles away. While the bluff looks formidable, the trail to the top is not. It is about 0.7 miles to the top and the trail maintains a reasonable grade. There is a sign on the short interpretive trail, so you won’t miss the route up the bluff. The trail passes just below Signal Rock. It’s an easy walk to the top of Signal Rock to get the same view seen by Gillem’s men. I found it interesting that the trail comes to an abrupt end with a rock pile. There is a large, steel fence just back from the top of the bluff. The fence is a remnant of an attempt to reintroduce bighorn sheep in the area in the 1980’s. The fence is within the Monument and the land beyond the Monument is also public land – the Modoc National Forest. In 1873, the trail continued north to Lower Klamath Lake on its way around Mount Dome (in the background of the above photo, with the arrow over it). It then went over the pass north of the community of Dorris and paralleled Highway 97 to Macdoel where it headed south to the Little Shasta River then down the river to Yreka. 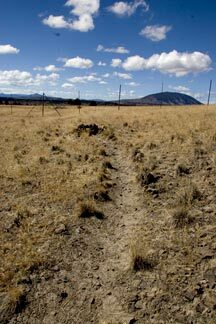 This was the primary route for supplying the troops for the Modoc War. I wondered around atop the bluff, enjoying the expansive view of the whole monument. The photo below is just part of the view. It gives a misleading perception of the flatness of the land. A perception that the Modocs used to great advantage during the war. This ‘flat’ land was created by a series of lava flows. The most recent is the black area of the Devil’s Homestead Flow, across the center of the photo. Besides creating rough ground as the lava flowed across, it also hardened at the top while hot lava flowed underneath. Ultimately the hot lava flowed out leaving many lava tube caves. During the deposition process or after, many of these caves collapsed leaving extremely rough, rocky holes many feet deep. This terrain coupled with the sharp rocks makes this a very nasty place to walk across, much less ride horses across, unless you know exactly where to travel. 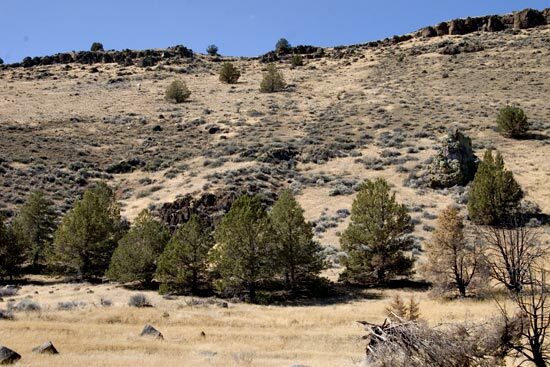 The Modocs did, the army didn’t and that was the advantage that led the greatly outnumbered Modocs to win every battle fought in the lava beds – even though they lost the war. We’ll explore some of the remaining lava tube caves in future articles. One report says that many of the civilians that followed the army to Gillem’s Camp stayed at a camp on top of the bluff. These civilians included teamsters, guides, interpreters, newspapermen, photographers, and a few women and children. I didn’t spot any evidence of this encampment, but further exploration is likely to uncover some evidence of temporary human occupation. 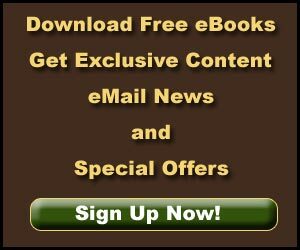 Modoc War – It’s Military History & Topography by Erwin N. Thompson. You may also want to visit the museum at the Park Headquarters and the Klamath County Museum in Klamath Falls to see artifacts of the war. This place clearly rates a 10 for history. Not only is it an important historic location, but there are visible remnants of that history and interpretation to make it even more meaningful. While generally barren, the views from the top of Gillem’s Bluff are quite spectacular. The Medicine Lake shield volcano, the largest volcano by mass in the Cascade Mountain Range, dominates the background while Lava Beds National Monument fills the middle- and foreground. There is a bit of adventure in the climb to the top of Gillem’s Bluff (watch for rattlesnakes). There is some variety in the cultural and geological aspects of the area, but there is little forest and no water to expand the possibilities. This is a great place for kids. They can get a unique education by being in the middle of history. Plus, they can burn energy exploring Signal Rock and climbing to the top of the bluff. 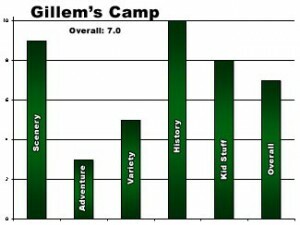 Overall I gave Gillem’s Camp a rating of 7.0 on our scale of 1 to 10. If you have been here and would like to offer your comments, please use the form below. The 1873 photo at the top is by Louis Heller. Most of the historical information is derived from Modoc War – It’s Military History & Topography by Erwin N. Thompson. All text, color photos and video by Jerry Haugen, Pathfinder. ©2010 Global Creations LLC, All Rights Reserved.